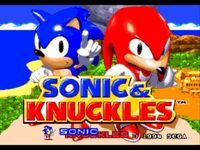 Sonic & Knuckles is a platform game in the Sonic the Hedgehog series for the Mega Drive/Genesis. It was developed in the United States at Sega Technical Institute by members of Sonic Team, and was published by Sega worldwide on October 18, 1994. It is the direct sequel to Sonic the Hedgehog 3, and is to be succeeded by the upcoming Sonic the Hedgehog 4.